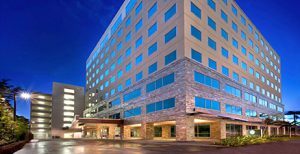 Hale Pawa’a is in the heart of Honolulu between downtown and Waikiki, within walking distance of the busiest Honolulu Hospitals and along well served public transportation routes. JACO’s clinic space on the 5th floor is close to 4,000 ft, including a beautiful private waiting area, fitness floor and lockers for storing your belongings. Parking is the best in the state outside of Molokai!! Take the parking elevator to G from where you enter the main building. Parking is validated for the first hour, after that it’s just one dollar per 30 minutes. 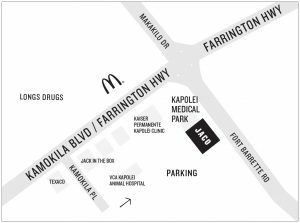 During your rehab sessions you can take advantage of the best rehab equipment and the biggest play/rehab space of any clinic in Hawaii! 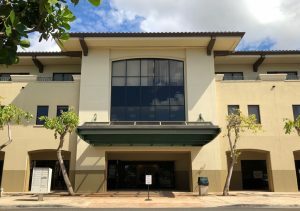 Mililani Gateway South is located in beautiful Mililani. 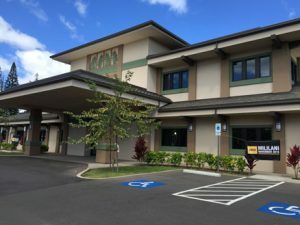 We are located in the Liberty Dialysis Building, which is next to Wayland University and across The Gateway at Mililani Mauka,. 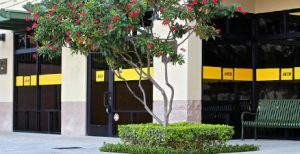 This is a brand new building with ample parking and easy access from the freeway.